Did you know that shared storybook reading is an evidence-based practice for increasing expressive language skills? Not only does rearch support shared reading, but it is one of the most natural and universally known adult/child bonding interactions! 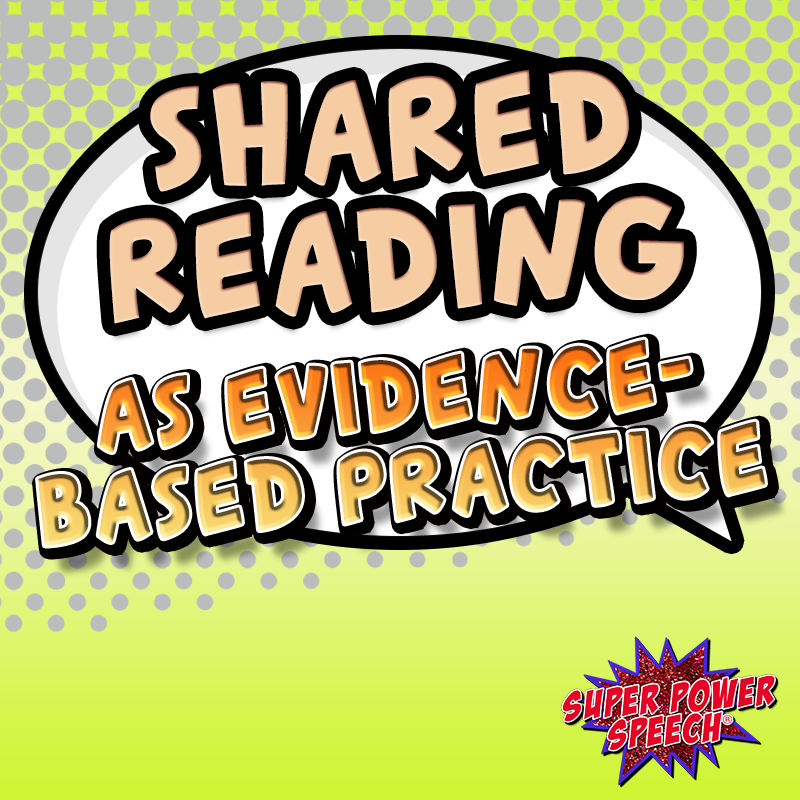 So… what do I need to do for successful shared reading? Pause after asking questions (Binger et al., 2008; Binger et al., 2010; Douglas et al., 2013). Sometimes we want to answer our own questions or provide little wait time, this is especially true for adult working with children with slow response time. However, pausing is a crucial step to allow all children time to know it is their turn to communicate and formulate a message. Respond to communication attempts or answers by children (Binger et al., 2010; Douglas et al., 2013; Crowe, Norris, & Hoffman, 2004). Responses are a way of closing the communication turn and acknolwedging the communication attempt of the child. These could be verbal such as, “I agree,” or nonverbal such as a smile or gesture. Are you interested in reading more abou tthe specific studies regarding shared reading? Here are just a few! In a study by Binger, Kent-Walsh, Ewing, and Taylor (2010), paraeducators were trained to use communication strategies with children with severe motor speech impairments in book reading activities. For this study, vocabulary displays on the children’s speech generating devices (SGDs) were created for each story including the main characters, actions, descriptors, and objects. As a result of the paraeducator training and use of the RAAP model, all three children in the study increased their multi-symbol messages during the intervention, generalization, and maintenance phases. In a study by Crowe, Norris, and Hoffman (2004), caregivers were trained to use a specific interactive reading routine with their child. The dependent variables included the number of communication turns, the total number of words, and the number of different words produced. Measurements were taken at baseline, during training, and finally during follow-up. “Attentional Vocative” establishes joint attention to the books through verbal or nonverbal initiation. This component could include saying “look”, gesturing, or pointing. “Response” includes any response to a query such as verbal words, pointing, gesturing, or signing. As a result of the CRC training, all children in the study increased the number of communicative turns, increased the number of different words used, and five out of six children incrased their total number of words between baseline and the trianing phase. What are ways to increase communication strategies at home and school while reading? Train staff and caregivers to effectively model language with AAC. Use colorful and fun short stories to capture the attention of students. Provide specific vocabulary for the stories on paper or within speech generating device vocabulary sets. Repeat book readings two to three times (but not more than three based on possible fatigue or lack of interest). So what picture books should I use with my students who experience language delay? There are too many great books to list! Click (affiliate link) here to check out some of my favorites. For a few of these fabulous picture books, I created light tech communication boards, so you are ready to begin your shared reading right away! But if you are wondering about adapting books for AAC, have no fear! Below you can find sets of books that I have wrote and added light tech communication boards with specific fringe vocabulary for each. Core Word of the Week books are extremely simple books that use repetitive lines and core vocabulary to teach early language learners. These books are included in my “Core Word of the Week Curriculum”. A-Z Alphabet Books for Me includes 26 unique books that focus on one letter per book. They include simple stories and a core board to model language for all students. These are perfect for preschool and early language learners! Have fun and happy reading friends! Binger, C., Kent-Walsh, J., Berens, J., Del Campo, S., & Rivera, D. (2008). Teaching Latino parents to support the multi-symbol message productions of their children who require AAC. Augmentative and Alternative Communication, 24(4), 323-338. Binger, C., Kent-Walsh, J., Ewing, C., & Taylor, S. (2010). Teaching educational assistants to facilitate the multisymbol message productions of young students who require augmentative and alternative communication. American Journal of Speech-Language Pathology, 19(2), 108-120. Crowe, L. K. (1996). Training Parents to Facilitate Language Through Storybook Reading. Crowe, L. K., Norris, J. A., & Hoffman, P. R. (2004). Training caregivers to facilitate communicative participation of preschool children with language impairment during storybook reading. Journal of Communication Disorders, 37(2), 177-196. Douglas, S. N., McNaughton, D., & Light, J. (2013). Online training for paraeducators to support the communication of young children. Journal of Early Intervention, 35(3), 223-242. Kent-Walsh, J., Binger, C., & Hasham, Z. (2010). Effects of parent instruction on the symbolic communication of children using augmentative and alternative communication during storybook reading. American Journal of Speech-Language Pathology, 19(2), 97-107. Light, J., Binger, C., & Smith, A. K. (1994). Story reading interactions between preschoolers who use AAC and their mothers. Augmentative and alternative communication, 10(4), 255-268. Yorke, A. M., Light, J. C., Gosnell Caron, J., McNaughton, D. B., & Drager, K. D. (2018). The effects of explicit instruction in academic vocabulary during shared book reading on the receptive vocabulary of children with complex communication needs. Augmentative and Alternative Communication, 1-13.